Note: no spoilers here, so read on. When Han Met Chewy…and Lando and the Millennium Falcon amid a lawless galaxy slowly falling under the thumb of the Galactic Empire. In this world, fuel is the main motivator for smugglers, pirates, outlaws and gangsters as the Empire’s military might rises. Escapism still rules throughout this enjoyable ride could have used more creativity and comedy. Enormous risk amid seemingly overwhelming odds are the real enemy in this origin story as the blanketing Empire and subset crime syndicate Crimson Dawn plays the antagonistic role that moves the rest of the pieces on the board. Language skills, outstanding debts, and enslaved races play a big factor here. Solo hints at some violent undertones, but avoids graphic violence and constant tension. “You won’t look at me the same,” one character tells another who wants to know what they did to survive. Audiences only get small glimpses of drama and tension like a shot of a family being separated by Stormtroopers. The second installment in the Star Wars anthology series is an enjoyable 135-minute ride as this origin story, helmed by director Ron Howard, stays close to the popular Star Wars formula. The previous Star Wars Story (Rogue One) was also safe and fairly predictable, but it had more heart than Solo. Alden Ehrenreich (The Coen brothers’ Hail, Caesar!) portrays Han Solo very well as Joonas Suotamo portrays the well-known Wookiee Chewbacca, previously portrayed by Peter Mayhew. It’s special to first see them do what they’re known for in the Star Wars film series. Chewbacca provides plenty of muscle as Han is the man with the plan. The background sequences on Han’s home planet Corellia could have provided some deeper character development, but basically establish his relationship with Qi’ra, played by Emily Clarke (Game of Thrones). Han’s desire to “win” and Qi’ra’s mantra “stay in it as long as you can” both support their survival instincts well. Epic events only previously mentioned in Han’s memorable dialogue (via original portrayer Harrison Ford) like the famous “Kessel Run” come to life here and the action-filled space chase sequences thrill. The Ford was also with filmmakers in several references including a prop placement on a table in the meeting room of Dryden Vos. The Teras Kasi fighting technique also gets referenced, but, unfortunately, audiences don’t get to actually see it in action. “I don’t think I’m ever gonna learn,” says Han as he continually bucks any authority he encounters. This repetitive element needed notable reduction. It was more interesting to see Han settle into the habit of making boasts or promises he can’t possibly keep…or so everyone thinks. Smuggler and thief Tobias Beckett, played by Woody Harrelson, becomes Hans’ mentor…of sorts, but just by chance. Harrelson is likable yet believable as a mentor and handles the physical challenges of the role very well. The supporting star power also includes Jon Favreau who voices Rio, Thandie Newton who plays Val, and Lady Proxima is voiced by Linda Hunt. 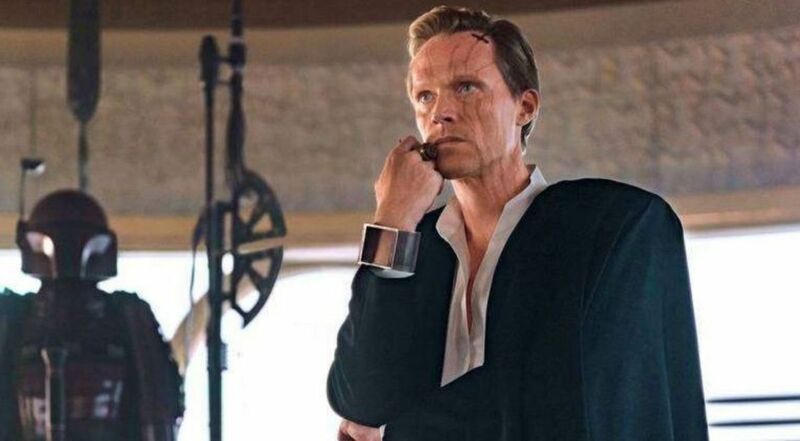 Dryden Vos, played by Paul Bettany, plays a Crimson Dawn boss could have used more hidden abilities to be truly threatening. His powerful decisions and lulling charisma still make him dangerous. Other famous baddies are referenced here and many famous dialogue exchanges from past installments in the Star Wars film series are repeated and varied in Solo. Lando Calrissian has charisma to spare and could easily be in his own spinoff. Played here by Donald Glover (Atlanta) and originally played by Billy Dee Williams, Lando’s confidence (or embellished ego) and resourcefulness forge several paths while his intellect usually sways his actions to the highest possible advantage for himself. Lando’s diary sequence in the Millennium Falcon is priceless. Clint Howard gets a notable role right before the debut of Lando’s L3-37 (“L3” for short) droid is perfectly voiced by Phoebe Waller-Bridge (Fleabag, Goodbye Christopher Robin). L3’s unique perspective on her “organic overlords” livens up the plot. Her fiery AI mind create endless zingers and memorable lines while her valuable navigation skills make her a valuable ally for Lando. Does Solo add to the Star Wars canon? Not too much, but it at least ties to the sequels, prequels and even the animated TV series. A little too safe and predictable, but Solo cover the bases well, which supports Han’s background and seemingly endless associations with every part of the galaxy. Ron Howard (In The Heart of The Sea, A Beautiful Mind) directed the film, while the original Solo directors Philip A. Lord and Christopher Miller (The Lego Movie) get executive producer credit since Howard reshot so much of the plot. Howard orchestrates some great action sequences, but offers a few too many landscape shots to track character whereabouts near the end. Lawrence Kasdan teams up with his son Jonathan on the solid screenplay. Lawrence previously wrote/co-wrote Star Wars: Episode V – The Empire Strikes Back, Star Wars: Episode VI – Return of the Jedi and Star Wars: The Force Awakens. John Powell’s musical score really enhances the action and emotional team-ups, especially when the Millennium Falcon appears. John Williams also combined two of his works to compose and conduct “The Adventures of Han” theme. This con man and all his risky businesses entertain while solidifying the Star Wars universe. Han shows his reliability when it’s time to do the right thing while his quick thinking and improvisation adds some nice unpredictability. 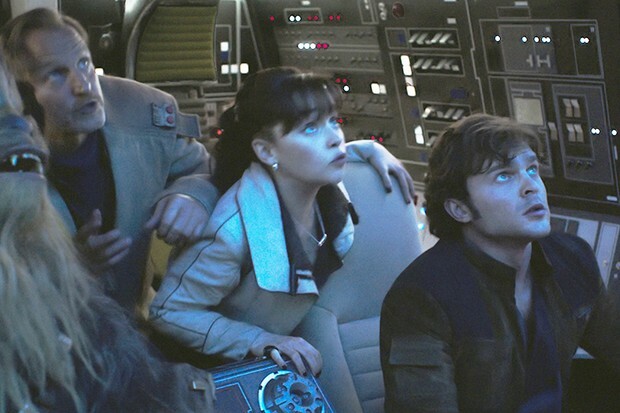 Filmed in London’s Pinewood Studios, Italy and the Canary Islands, Solo: A Star Wars Story comes recommended (*** out of four stars) and is the fifth Star Wars film to carry a PG-13 rating (sequences of sci-fi action/violence). A few mild surprises keep things lively, but one big revelation really adds a lot of promising potential for future installments. 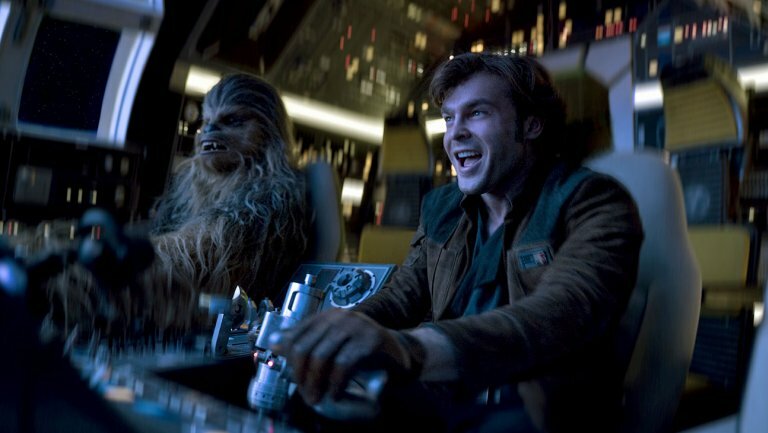 Ehrenreich will appear as Han Solo in two future films…in some capacity (supporting or lead). Check out the 2016 short film Han Solo: A Smuggler’s Trade. This entry was posted in 2010s Film Reviews, Film Reviews and tagged Chewbacca, Film, Han Solo, Michael Siebenaler, Mike Siebenaler, Solo, Star Wars, Tall Writer. Bookmark the permalink. A lot of fun for sure. Nice review.